Media: Soft cardboard cover; 302mm x 226mm in portrait format; 38 pages including covers; almost 90 b&w and 22 colour photos; detailed captions; 29 colour profiles; emblem artwork; tables. Advantages: Some wartime, operational photos and walkaround pictures; bi-lingual captions (in English and Polish); good quality plans included; lists and analysis of available models (Polish text only); attractive colour profiles. Recommendation: Recommended mainly as an inexpensive source for pictures and plans. Ace Publication's new volume on the Messerschmitt Me 163 comprises 36 pages plus covers, including four pages of full colour. The covers also host attractive colour profiles and scrap-view pictures. The book provides brief coverage of the prototype, operational variants, planned developments and the related Japanese J8M1. The body text is in Polish only, but the captions are bi-lingual (Polish/English). It is a particular shame that there is no English language summary, as a large proportion of the book is devoted to history of the Komet, and analysis of available model kits. This will only benefit those who read Polish. The best aspect of the book lies in its photos, colour profiles and line drawings. 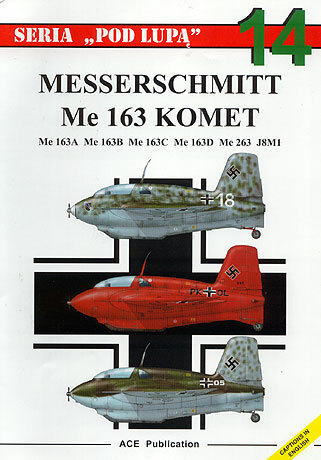 Ace Publication's "Messerschmitt Me 163 Komet" represents an inexpensive introduction to the subject of the Komet. The colour museum photos might be helpful, and the colour profiles may supply some modelling inspiration but, especially for non-Polish speakers, don't expect a thorough analysis of the type in this volume. Recommended mainly as an inexpensive source for pictures and plans.